We went through the usual "What do you want to be for Halloween" thing months ago. I don't know why I even bring it up so early because the "Pickles" never decide until the last minute anyway. 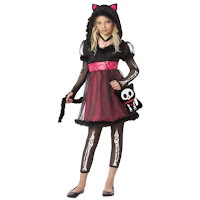 The Girl had originally said she wanted to be a ferret but after flipping through catalogs showcasing $40 and $50 costumes, she decided she wanted to be a "skel-animal cat" or whatever it was called. NO. Absolutely NOT. I shouldn't have had to, but I gave her my reasons. I started with the practical reasons. We live in COLORADO. There might be SNOW on the ground on Halloween. The costume will be too COLD. I moved on to the confused reasons. What IS it? It looks like just a short dress with bones on the tights! I went even further to the financial reasons. Forty dollars for THAT? We could put together a MUCH better costume for WAY less than FORTY DOLLARS! I didn't even bother going into the "you are 8 years old and have no business wearing that" speech. WHY are they making little girls' costumes look more and more...sultry? The answer, as she finally heard from Mr. LH, was still "NO". The next day after much pouting, she decided to be a fairy, like Twig. The following day it was "something scary, like a vampire." Then a werewolf and back to a vampire. When she stayed with "vampire" for a couple days, I held her to it. She actually had me on youtube looking up vampire make-up techniques so her costume would be "right". The Boy was a little easier. He thought about maybe being a mushroom (how many children dream of being a mushroom for Halloween) but then settled on a pirate. But with The Boy, it went from a plain pirate to a "ghostly pirate" then a "zombie pirate". I wasn't sure what we'd wind up with...some form of spirit of an un-dead pirate, maybe? We got lucky with the costumes. We have a couple of bins full of costumes and accessories from years past. I still had to buy little extras, but we had thick, warm capes, jewelry and some accessories and Halloween makeup. Thank goodness they made their decisions when they did because I was able to go to our local thrift store the next day (which happened to be a 50% discount day) and fight the crowds of other parents who were also scouring the Halloween merchandise. I found some pants, a couple of hats (so he could choose the one he wanted) and boot toppers for the pirate costume ($8). He already had a belt and wooden sword that we bought him several years ago at a Renaissance Festival in North Carolina. The pirate shirt was more difficult to locate. In fact, I never found one (without having to actually buy a pirate costume). I would have settled for a long-sleeved Henley. I wound up stitching one together one afternoon from some leftover fabric I had. I also got some stretchy spider webbing just in case he still wanted to do the "zombie" pirate thing. I found a long "velvety" dress and thick black tights for The Girl (just in case it was cold). Both were obtained from the thrift store ($5). I also purchased a red and black wig from Walmart ($6) and black sparkly nail polish ($2). We got her some fangs - a set of the cheap plastic kind as well as the more elaborate "custom" fangs ($3). Because of her large front teeth, the cheap set didn't work (though I don't think it would have worked with perfect teeth) and the custom set intimidated her a bit. We opted to simply "paint" on the fangs. As a side note: The wig, once out of the package and unfolded was in no way going to straighten out like the wig in the photo. It was a tangled, sloppy mess. It looked like our vampiress was going to have a "just rolled out of bed" look. I believe I spent more on the candy for trick-or-treaters than I did on their costumes. And the costume pieces will be placed into our costume bins to be used again for future costumes. The Boy should be able to pull together a pretty good "non-zombie" pirate outfit for the Renaissance Fair next summer. The Movie Tavern - Finally!